Not to hammer on this Jay Z and Solange domestic violence issue but on a recent episode of “The View”, they were talking about the attack and Whoopi Goldberg said, “if I slap a man, he has every right to slap me back.” While her statement may not sit well with a lot of people, she does have a point. Before I continue this, lets first of all watch this video of a woman dishing some hot slaps to her husband. So what do you think? Do you agree with Whoopi Goldberg? Prev Is Donald Sterling a Racist? Next Can too much Masturbation lead to a weak erection? No jokes. Some women has this thick palms that if they slap a man he may shed tears. I’m still scared of my mum till tomorrow cos of that. I didn’t grow up seeing my parent exchange words, I can’t even raise my hands against my kid sister. I can’t beat a female. God help me with my female children, make dem no go spoil finish. Only a coward will hit a woman. But our women should be careful, its not all men that can take a slap and walk away. You are a better man. My neighbors wife used to get real violent with him. It stopped the day he beat her out of the house. She ran to my house in tears, my roommate had to open the door for her out of fear that he would hurt her. To our knowledge she never hit him again after that day. Yes and No. It depends on the circumstance. He can give her a warning slap. If a woman has enough guts to hit a man, in my opinion, she should have the guts to follow through because you’ve basically told him that you can match him physically. Why act surprised when he hits you back? Not all men have enough control to walk away and lets face it, if he does walk away, i can assure you that the said woman will chase him down with insults or probably more slaps to the back of his head. 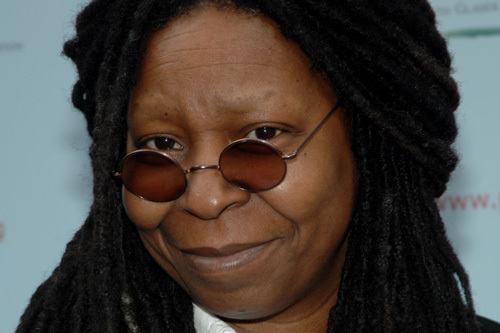 Whoopi said he has the right to hit her back, she didn’t say he should hit her back. There’s a difference. I agree with Whoopi, but I am happy that most men show restraint and walk away. Any woman that hits a man should be ready to get same back. Do unto others what you want to be done to you. Women say what a man can do a woman can do better and all about equality(when it comes to salary, job, society, and also in homes) and all but when it comes to issues of this kind they say no equality. I don’t get it. This is a touchy subject, but I believe that no one should hit another person in general; whether your female or male you shouldn’t hit another person, not everyone can be the bigger person and walk away. Think before you hit someone, because there are people who won’t stand for it and will hit back no matter who you are. No he shouldn’t, rather he should spare his revenge until bed time and then go hard and deep into her.